More than 100 different tribes are native to Tanzania, as well as many more immigrants from abroad. Masai warriors perform a traditional cultural ceremony in Tanzania. Editorial credit: Aleksandar Todorovic / Shutterstock.com. Tanzania boasts of a rich cultural diversity, with over 120 indigenous ethnic groups and over 100 different dialects spoken across the country. Each of these ethnic groups has their unique language, social structure, and culture, with notable similarities between them. Ethnicity in Tanzania is also a product of the geographic area, as each tribe is concentrated on various parts of the country. The Sukuma are Bantu-ethnic group. They are the largest ethnic group in Tanzania, making up about 16% of the country's total population. Sukuma means north, and the Sukuma means people of the north. They inhabit the northwestern part of Tanzania and are concentrated near or on the southern shores of Lake Victoria. Historically, the Sukuma people were organized in autonomous chiefdoms. It was during colonization that these chiefdoms united to form one unit. They predominantly speak Sukuma language, which is a Bantu language of the Niger-Congo family. About 1.5 million Tanzanians make up the Nyamwezi ethnic group, which is the second largest in the country. The Nyamwezi people migrated to Tanzania during the Bantu migration from the Great Lakes Region of Central Africa. They occupy the provinces of Tabora and Shinyanga, collectively referred to as the Unyamwezi region and speak the Kinyamwezi language. The ethnic group is made of four distinct groups, and their culture is dynamic, having been influenced by their African neighbors and westernization. The Haya people settled in the Kagera region of Tanzania during the great Bantu migration. They speak the Haya language, a dialect of the Bantu languages. They were highly skilled in metal work and were organized in a system akin to feudalism. The modern day Haya people are mainly cultivators and have adopted Christianity and Islam alongside traditional religious practices. The Hadza ethnic group resides in northern Tanzania, around Lake Eyasi. The Hadza are indigenous hunters and gatherers tribe, one of the last practicing hunter-gatherer tribes in Africa. They are culturally distinct from other tribes in Tanzania, and only share few similarities with the Khoisan people of southern Africa. They trace their ancestry to the original hunters-gatherers Bushmen of medieval Tanzania. There have been numerous attempts to civilize the Hadza since the colonial era, attempts which have proven futile. The Hadza people live like their ancestors did, and do not observe days, hours, and months. Encroachment by neighboring groups, safari hunting, and tourism are emerging as threats to the Hadza unique way of life. The Maasai are a Nilotic ethnic group native to Tanzania and neighboring Kenya. The Maasai are mainly herders although agriculture is also practiced. The culture of the Maasai has remained largely unaltered and involves a rich variety of oral literature and songs. 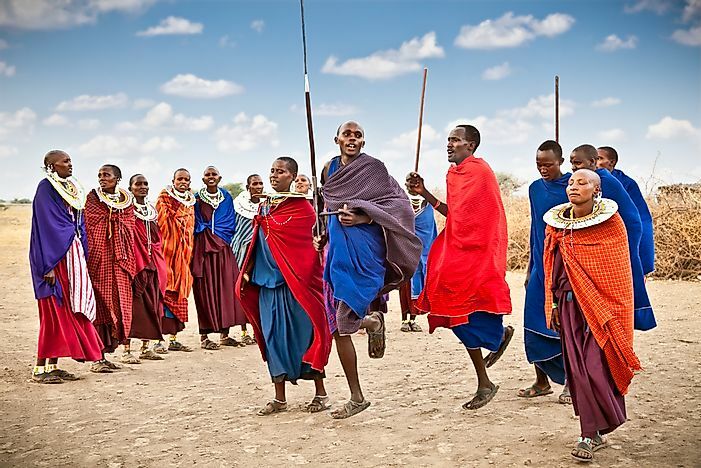 The Maasai in Tanzania is slowly integrating into mainstream social and economic life amidst great reluctance. Tanzania has a large pool of other indigenous ethnic groups. These groups include Makonde, Hadzabe, Hehe, Ikoma, Gweno, Ha, Mande, Kamba, Akiek, Alagwa, Gorowa, Digo, Bembe, Balouch, Kwaya, Kutu, Kisi, Luo, Kwavi, Luguru, Magoa, Bende, Dhaiso,Yao, Zaramo, Zinza, Ware, Zyoba, Zigula,Zulu, Timbuka, Wanda, Swahili, Twa, Tutsi, Vinza Nyaturu, Ngoni, Nindi, Kimbu, Kerewe, Ndonde among others. Arabs and Asians were linked to Tanzania through ancient trade of products such as textiles, gold, horns, and ivory. Tanzania, being located on the Indian Ocean's coastline was a vital African port. Europeans settled in Tanzania during the colonization era, and some of them remained after the country gained independence. Despite having different ethnic groups, Tanzania has largely been spared of ethnic conflicts that have rocked some of its neighbors. This situation is mainly attributed to the Swahili language, which is the national language in Tanzania. None of the ethnic groups in Tanzania enjoy dominance in either the political or economic platforms, and this has brought a sense of unity in the country.